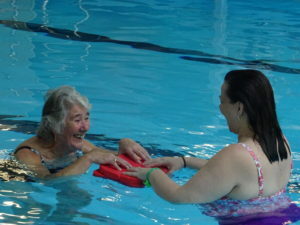 Waders offers exercise in water for people with physical difficulties. Whether your problem is neurological (eg MS), orthopaedic (eg fracture, joint replacement) or rheumatic (eg arthritis, fibromyalgia, CRPS) in origin, it is likely that you will benefit from exercise in water. Bouyancy enables you to perform activities which are often difficult or painful on dry land. We currently offer four sessions a week across two pools supervised by a qualified Aquatic Physiotherapist. Please telephone before attending your first session so you know what to expect and because times and physio do sometimes change. Each session costs £4 including pool entry, plus refundable 50p for the locker. Annual membership is £15 (Jan-Dec). Please arrive twenty minutes to half hour early for your first session to allow time for getting changed, and a brief assessment which you will need before you are allowed in the water. Please also bring with you a list of any medication you are on. The back of your prescription is a good place to find it. If you have angina or asthma, bring your tablets or inhaler to the poolside with you. If you need help, your carer may join you free of charge. Both pools have disabled changing facilities and a poolside hoist with a maximum weight of 25stone/158kg. Please be careful when walking in the changing rooms and around the pool. Walking aids can increase the risk of slipping on wet floors. Take extra care!